Relative Strength Index (RSI) developed by J. Welles Wilder Jr. is one of the most used technical indicators and became a part of every trading system. As a momentum oscillator it serves as a gauge of speed and change of a price movement. The indicator was mainly used for trading the commodities and later also forex. However, due to its popularity and relatively precise measurement results, it has become pretty used by stock traders too. Calculation is simple: RSI = 100 – 100 / (1 + RS), where RS is average gain during the specified period divided by average loss during the specified period. Interpretation is more interesting and comes as a separate block under the chart with a range from 0 to 100. Time frame is usually set for 14 periods. Then, there are two levels that you need to set values for and these are also usually preset for 30 and 70. These levels are displayed as two lines within the block and serve as important separators where trading decisions are made. Generally, when RSI goes below 30, the security is seen as oversold, which may signal that it is the right time to buy it, because price will go up. When the RSI goes above 70, the security seen as overbought, which may indicate that it is right time to sell, because price will go down. When RSI is moving between 30 and 70 is it seen as neutral, which may indicate that price is not going either up or down. Some traders may prefer to change to values to 20 and 80 or others that they believe are more appropriate to decide on further price movements. Finally, there is also central line, which happens to be watched especially when stock is in trend. 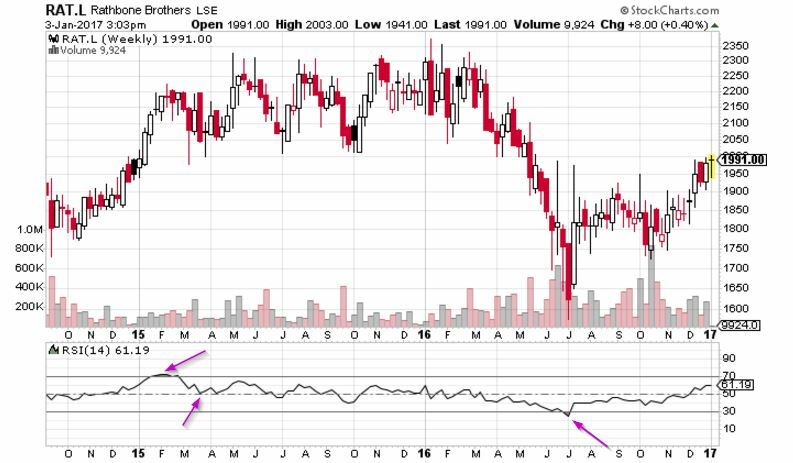 Example above shows when the stock went above 70 and was overbought in February 2015, which led to fall in price, however not for long (short-time traders might see it as good opportunity to short-sell the stock) till it stopped at the central line and bounced back upwards. So here the direction did not necessarily happen. Following year and a half the Relative Strength Index was in neutral zone (see that stock price was going sideways and no real opportunity for buy or sell was available) until it dropped below 30 in July 2016 and stock became oversold. Here the real price direction reversal happened when both RSI and price made her way up. Most importantly, it is crucial to watch RSI behavior within the entire values range to make the correct decisions and then it will give great signals in trend analysis. Andrew Cardwell did a great job and enhanced the RSI concept so it can be used to identify and follow trend, its change, divergence and support or resistance levels. Once Relative Strength Index goes over 70 and becomes overbought, it does not necessarily mean a reversal and following bearish market. Using Cardwell’s theory we can find spot a trending bullish market. It was spotted that uptrend was usually traded with RSI between 80 and 40, while downtrend was traded with RSI between 20 and 60. It is important for trader to use this tactic only for bullish or bearish trend, never for both in a same time. Looking at FMC Tech. 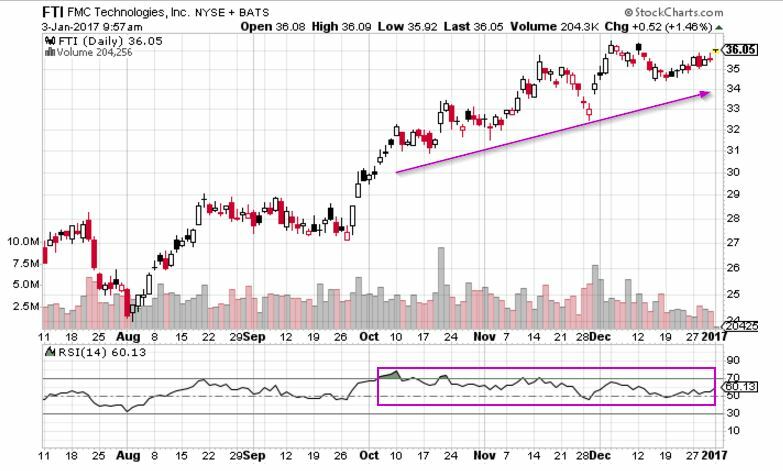 above we see a great example of trending stock, where RSI can be used as a favored tool to identify bull market. The RSI is moving within the range of 80 and 40, while stock price is steadily and constantly increasing. Note, the RSI doesn’t need to make the same or higher highs to make the price go higher. Short-time traders may find the RSI lows as support and RSI highs as resistance levels. Rational investor would find RSI ,together with other technical indicators such as MACD, as a good supportive signal to enter a long-term buy in November and hold.